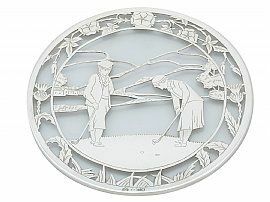 This exceptional antique George V sterling silver teapot stand has a circular form. The plain glass body of this antique teapot stand is embellished with an impressive hallmarked sterling silver overlay. 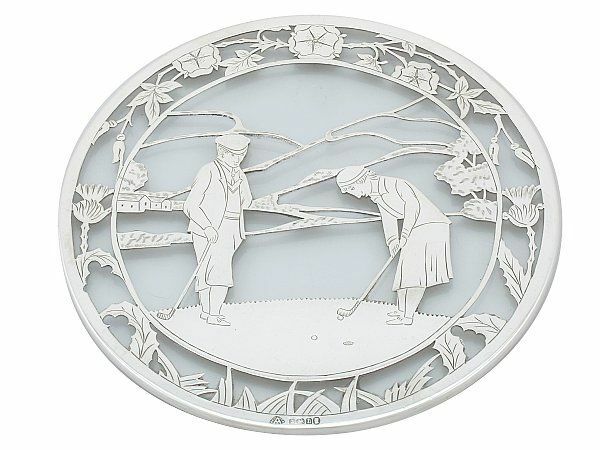 The silver overlay is ornamented with a central, simplified pierced decorated scene depicting two characters playing golf, with a rural town and hills in the background. The ornamentation to the upper plateau is encompassed with a thistle, floral and foliate decorated border. This antique teapot stand is an exceptional gauge of silver for its type, exceptional quality and exceptional condition in keeping with age. There are some surface blemishes as to be expected in keeping with age and use. The glass body is in perfect condition. Full hallmarks struck to the surface of the stand are all very clear.